Clarksville-Montgomery County Schools received good news on Tennessee’s school data release with 16 of its schools performing in the state’s top five percent and being named “Reward” schools. Barksdale Elementary, Byrns Darden Elementary, Montgomery Central Elementary, Hazelwood Elementary, Glenellen Elementary, East Montgomery Elementary, Northeast Elementary, Sango Elementary, Woodlawn Elementary, West Creek Elementary, Carmel Elementary, Rossview Elementary, Pisgah Elementary, Oakland Elementary, Northeast Middle School and Middle College High School at Austin Peay State University. 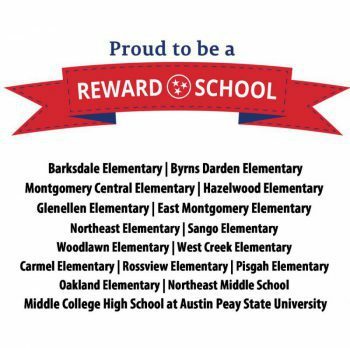 CMCSS had 11 of its schools on the Reward School designation list for the previous year.